If you’re one of the two million people in the U.S. living with the loss of a limb, you know how important physical rehabilitation is for those seeking to recover after an amputation. Therapy helps amputees learn how to adjust and recover as much of their functional life as possible. The good news is that surgical techniques, rehabilitation methods and prosthetic designs have improved greatly, and so most amputees are able to function at high levels. Physical therapy takes many forms, and varies depending on the person and the amputation type and location. One of the most commonly used amputation rehabilitation techniques is cold and compression therapy. Modern-day equipment exists that helps make this therapy more effective, convenient, and flexible so amputees can take advantage of the treatment anytime, anywhere. Active cold compression therapy reduces the size of blood vessels in the area, helping to control excess bleeding and swelling of soft tissues surrounding the amputation. Research on cold compression therapy has found that it reduces swelling by limiting the pooling of fluid in the injured tissue outside the blood vessels. Pain management immediately following surgery is a one of the most important concerns for amputation rehabilitation therapists. Long-term pain, known as persistent pain, can last for years and range from mild to severe. 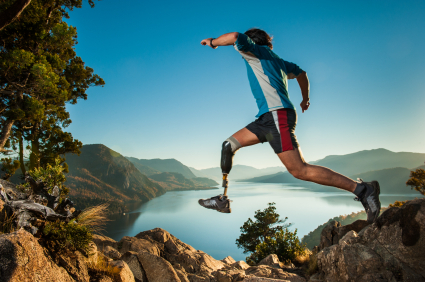 Phantom pain is experienced by as many as 80 percent of amputees; this is pain experienced in their residual limb or pain that feels like it is part of the missing limb. There are a wide range of pain management therapies. Cold treatments are one well-accepted method for pain control and when active cold compression systems are used, many therapists find even greater pain relief because the combination improves surface contact so that faster, deeper and more long-lasting cooling can occur. Edema is a common reaction of our soft tissues following injury. Edema (from the Greek word for ‘swelling’) is caused by an excess of fluid that builds up around the injury site. With an amputation, especially of a lower extremity, there is great disturbance of the normal pattern of blood and lymphatic channels and of the pressure relationships inside the blood and lymph vessels and in the tissues that surround the limb stump. Over time this edema usually subsides; however, some amputation rehabilitation therapists find that using a combination of active cold compression on the affected area accelerates the reduction of edema. Your medical team wants to fit you with a prosthetic as soon as your body is ready for this step. This can’t occur if the amputation site is swollen and painful. Active cold compression therapy helps to control both pain and swelling so that the all-important prosthesis fitting can occur. Further, ongoing cold compression treatment helps alleviate the swelling that can often occur after wearing prosthesis for a long period of time. Amputation rehabilitation is critical to your recovery - how can we help with your therapy?